… to other writers. 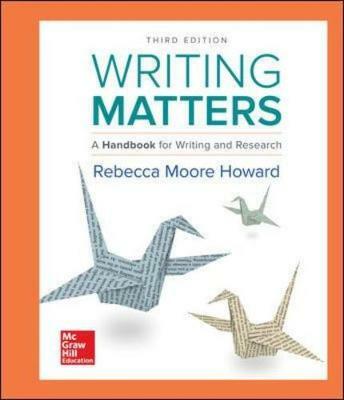 Writing Matters emphasizes the responsibility writers share, whether collaborating online in peer review or conducting research with digital and print sources, to treat information fairly and accurately and to craft writing that is unique and original—their own! … to the audience. Writing Matters emphasizes the need to use conventions appropriate to the readership, to write clearly, and to provide readers with the information and interpretation they need to make sense of a topic. … to the topic. Writing Matters encourages writers to explore a topic thoroughly and creatively, to assess sources carefully, and to provide reliable information at a depth that does the topic justice. … to themselves. Writing Matters encourages writers to take their writing seriously and to approach writing tasks as an opportunity to learn about a topic and to expand their scope as writers. Students are more likely to write well when they think of themselves as writers rather than as error-makers.